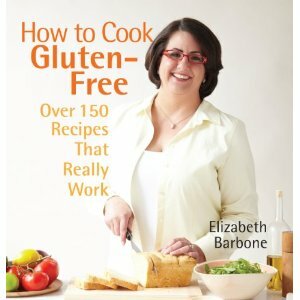 CONGRATS to R Lin… you are the winner — A copy of How to Cook Gluten-Free: Over 150 Recipes That Really Work by Elizabeth Barbone is all yours! Please contact me at celiacinthecity@gmail.com to claim your prize! Anyone else have that one cookbook that you go back to again and again? Even when you have stacks of other books. When you just need a recipe to work, the first time, without having to do converting or shopping for hard to find gluten-free ingredients? That book for me is Elizabeth Barbone’s Easy Gluten-Free Baking. It was one of the very first gluten-free books I purchased and I have been using it ever since. Any time I need a baking recipe, usually for a crowd of friends or family, I go to that book. She has never let me down. Not once. So when I found out she was working on another book, I was thrilled. (I’ve had it on pre-order since she announced it would be for sale on Amazon. 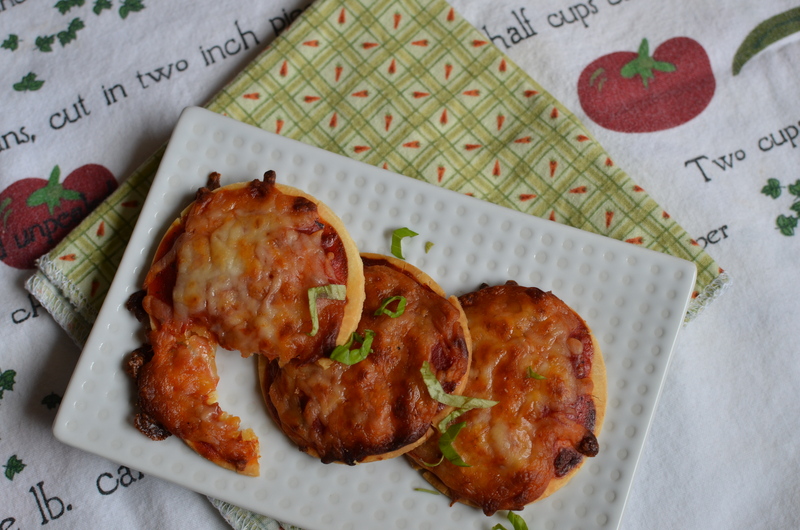 Then Elizabeth one-upped that and offered some blogger friends the opportunity to preview some of her recipes — I was all over it, especially when the first recipe mentioned was pizza. This crust was rolled out thin, nice and crisp. 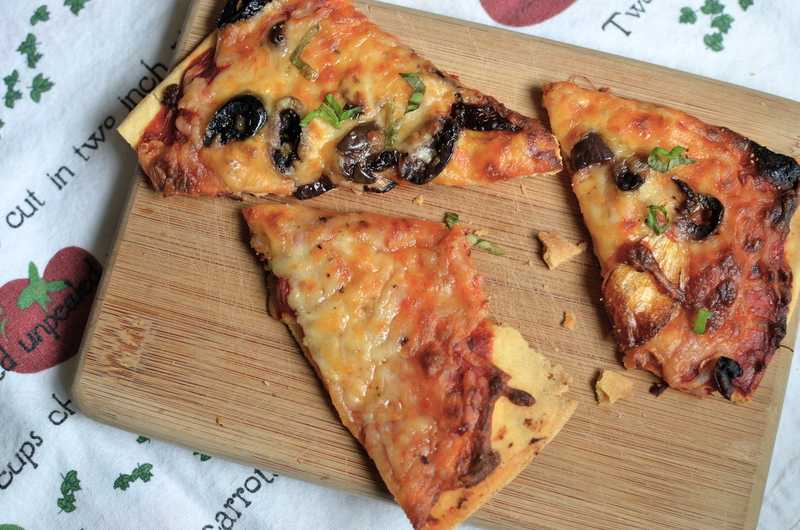 I started with plain cheese to keep things simple, then worked my way into “Elizabeth’s Favorite Pizza” with kalamata olives and caramelized onions — which she gives a tutorial for at the beginning of the book, with step-by-step picture instructions. This crust is perfect for a busy weeknight when you’re craving pizza (That’s pretty much any night for me, who am I kidding?) 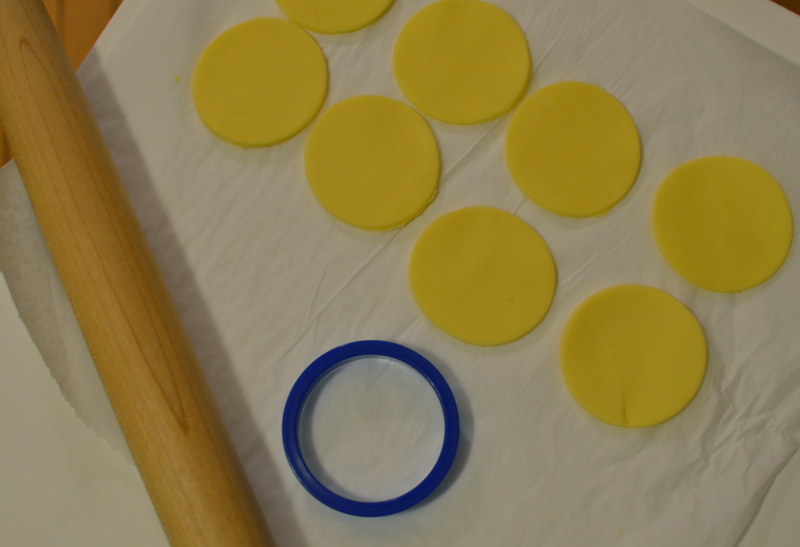 but are limited on time — no waiting for the dough to rise. And you know me, if there is an opportunity to make something in mini form, I’m on it. 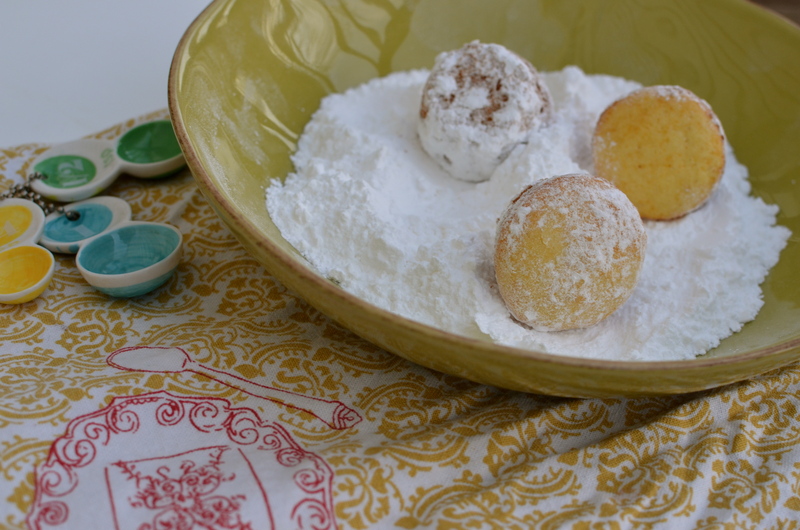 I added some cinnamon to the powdered sugar — but you could dip these in regular sugar too, the key is to do it right when they come out of the oven so the sugar sticks. Or…if on the second day they are a little lacking on the layer of sugary goodness you really need, you can re-sugar them. 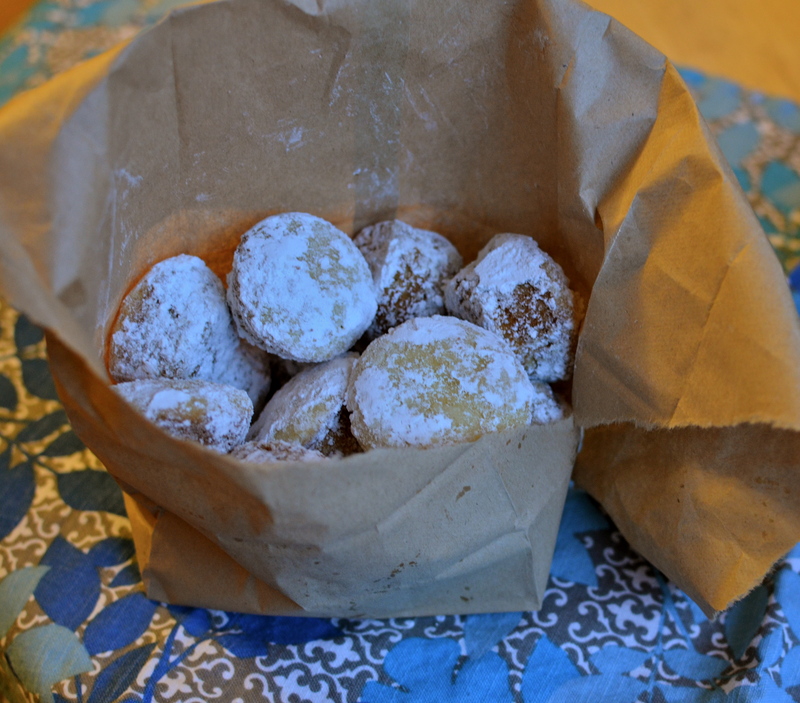 Just put them in a small bag, add a little scoop of powdered sugar and give it a little shake. There is a “How To” section at the beginning of the book with tutorials (and all kinds of pictures) for stocking your kitchen, making caramelized onions, peeling those onions, dicing, frying, and pretty much any other technique you might need to use. Have other dietary needs? No worries, there are substitutions for egg free and dairy free options. The recipes are simple, easy peasy, anyone can make them — and the ingredients won’t have you running all over town. I made all of the recipes here with items from the pantry. So leave a comment below with your favorite pizza toppings and you’re automatically entered to win. Really, that’s it. Subscribe to this blog — in the top right corner of the home page, just enter your email and you’ll never miss a post! *Make sure you leave a separate entry for each one for them to count! A winner will be drawn on Sunday, March 18th at 8pm CST. Posted on March 14, 2012 by Sarah @ Celiac in the City •	This entry was posted in What's up in the city? 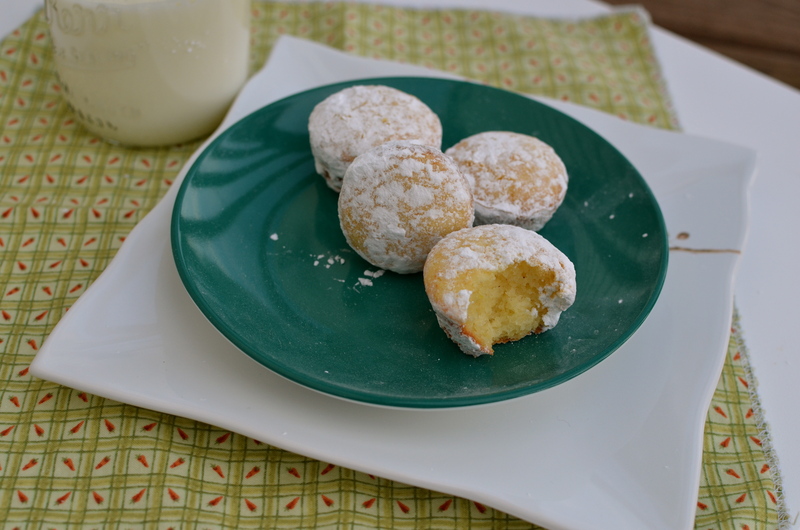 and tagged easy gluten free pizza crust, Elizabeth Barbone How to Cook Gluten-Free, gluten free cookbook, mini powdered sugar doughnut muffins, no-rise pizza crust. Bookmark the permalink. As far as pizza toppings, I like lots of sauce and cheese. Thank you so much for the book. I am sure that I will have a very good use of it. Any topping is my favorite pizza topping! This cookbook sounds amazing and I would love to be the lucky winner. Thank you! I really need some new gluten free recipes. My favorite is lots of cheese – mozzarella, asiago, parmesan, chicken, diced tomatoes, ham, and mushrooms. Top it off with a sprinkle of garlic and Mr. Z’s zesty pizza seasoning topping. ground beef, artichoke hearts and red onion. yum! I believe I have liked or followed all your links most I had already been following! We all love sausage with extra cheese and mushrooms. I would love to win that book to help make stuff for my 8 yr old who recently on the diet, still new at this. Our fave pizza toppings include sweet potatoes, fennel, kalamata olives, capers, artichoke hearts, roasted red peppers, fresh basil, curried chicken sausage, shrimp, slivered onion, pesto, spinach, bbq chicken… not all together, but in various combinations! Our fav crusts have been either “Rustic Crust” Gluten Free, or Vicco Cornmeal Crust, OR lately our own deep dish baked polenta crust. I like glutenfreebaking on Facebook! This book looks wonderful. Made a great gluten free dairy free soy free lasagne myself recently. Used butternut squash for the sauce, very little tomato. Could easily have none. And celebrated St Pat’s with a gluten and dairy free Fish Pie. So yummy! Love onions and mushrooms. Thank you for an opportunity to win the cook book. My 9-yr-old is gluten, dairy, corn, and soy free and also happens to have Down syndrome. Sometimes it’s tricky to find things she will eat. Love also cooking for my two nieces and sis-in-law who are also GF. It’s always great to find GF recipes that the whole family can enjoy without having to be a short order cook;) Thanks for all the great GF info on FB!! I am always looking for new recipes. This makes it much easier to live with celiac. i love any kind of “white” pizza! I’ve subscribed, liked and followed. I’ve love a copy of this cookbook. Sweet potato, onion, bacon, and ricotta. We Love Mollys GF Bakery! I follow Gluten Free Baking on Facebook! I liked glutenfreebaking.com on Facebook! My favorite pizza topping is extra cheese! love onions and bell peppers! My favorite pizza toppings are ham and pineapple. goat cheese, roasted red peppers and pepperoni! Favorite pizza toppings are pepperoni and mushrooms..and extra cheese. Green pepper and mushrooms with a meat – pepperoni, sausage or chicken. Favorite pizza topping? I think that’s like asking a mom to pick which kid is her favorite. 🙂 Our favorites are either pepperoni and bell peppers OR barbecue sauce/chicken/bell peppers. YUM! We can’t eat tomato now, so we enjoy a white chicken pizza with ricotta and mozzarella cheese. A treat for me is to order in a personal pizza… bacon, black olives, red peppers and banana peppers. My favorite toppings used to be sausage, green peppers and onions. 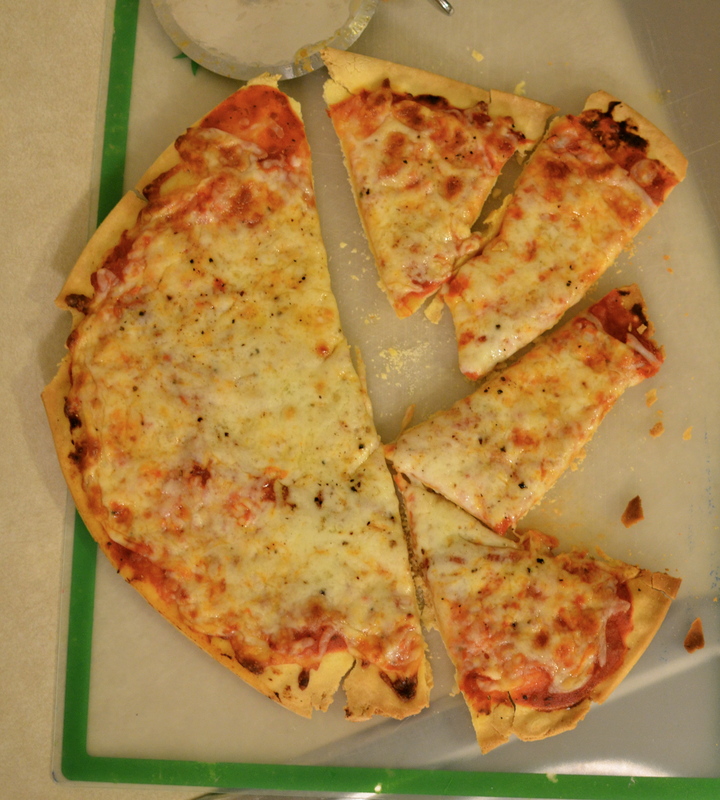 But I haven’t had pizza since I got diagnosed two months ago–I haven’t gotten around to making my own gf crust yet! 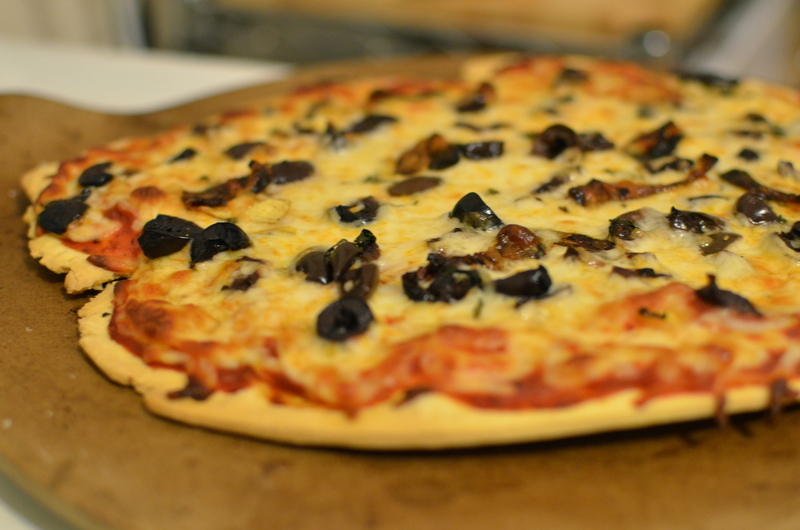 Veggie pizza, with mushrooms, black olives, onions and green peepers is my favorite! i usually go with the cheese and onion pizza, but if i’m daring, i’ll go with bbq chicken pizza. before my gluten free days, i’d order bbq chicken pizza from the milwaukee ale house. it was fabulous! I love salami and black olives! yum yum yum. I can’t eat tomatoes, so I like pesto with kalamatas, red onions, feta and garlic. I like GlutenFreeBaking.com on Facebook. I follow @celiacinthecity on Twitter, I’m @cakedarla. I follow @ElizBarbone on Twitter, I’m @cakedarla. What a fantastic giveaway, thanks for hosting! My favorite pizza toppings are mushrooms, black olives, and green bell peppers.